YOU WANT to rent or buy Singapore homes? E-mail details of your specifications to judy@asiahomes.com or Tel: +65 9668 6468, 6254 3326, 9668 6469. Fax: +65 6256 0501 for viewing or updates. E-mail or fax house-hunting form to us at 6256-0501 and we will contact you within 24- 48 hours. 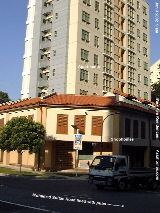 One block of high rise of 32 apartments behind 5 townhouses at 80 Kim Yam Road. Suits single expatriates and yuppies. 5 Conservation shophouse-style townhouses with wooden floor boards and modern bathrooms (foreground) are extremely popular with Caucasians. 32 apartments behind the townhouses. Living and dining area with kitchen on first floor. On second floor, the master bedroom with an attached bath in front (see brown louvred windows above). One bedroom behind with a common bathroom outside. One attic bedroom below roof. Living/dining - pastel coloured marble floor. Bedrooms: wood strips. 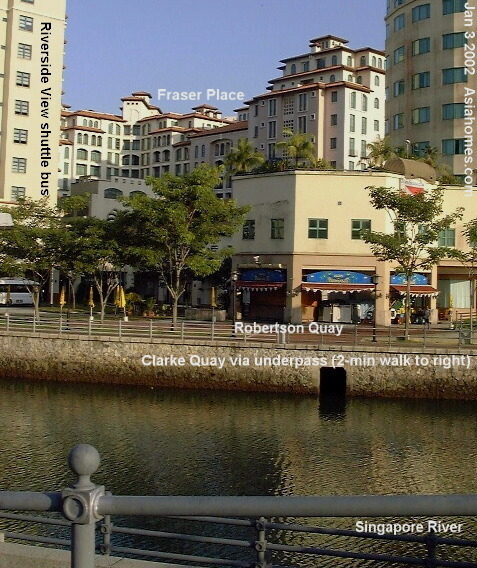 There is an underpass for morning and evening joggers to get to Clarke Quay (right of picture). 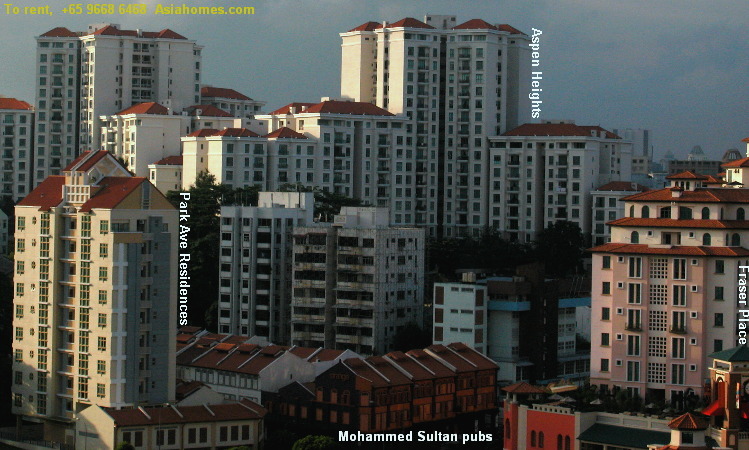 The famous Mohamed Sultan pubs are behind Fraser Place in the above picture. Park Avenue Residences. Certain high floor units have Singapore River views. Expats who want fun and food will greatly appreciate networking with other expats at this Robertson Quay and Clarke Quay area. 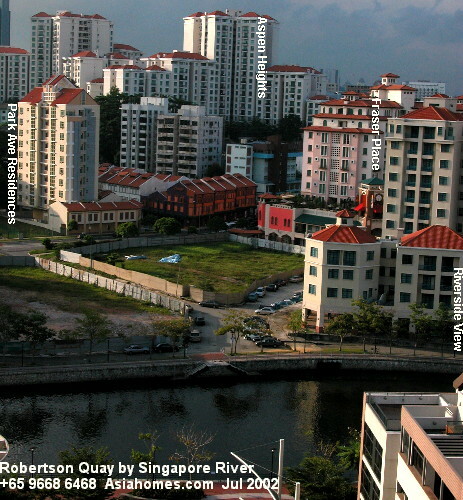 See Singapore River in the picture left. Park Avenue Residences are at the top left in the picture. Outside the Central Business District. You don't need to pay an electronic toll charge whenever you go to your apartment. A modern bright apartment with pastel coloured marble floor tiles. Maid services 3 times per week. The tenant pays for phone installation and cable facilities and internet access. Gas cylinder for cooker hob. Small open concept kitchen. Historical conservation area. The Townhouses resemble modern fully air conditioned conservation shophomes which can be used as home offices and do appeal to romantic expats. 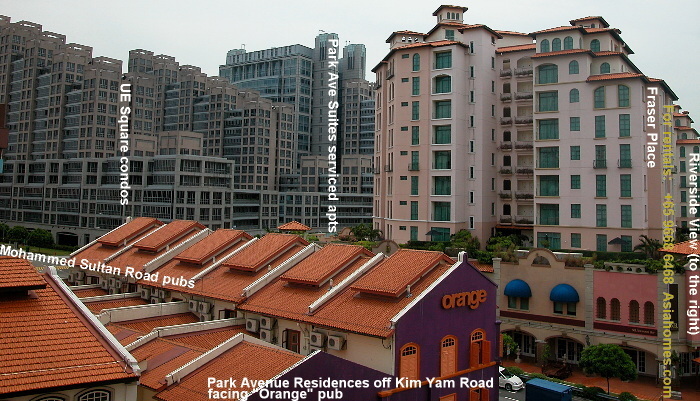 Close to the sparkling green Singapore River and the Fort Canning Park for jogging or walking the dog. A 3-minute taxi ride to Suntec City, Raffles Place and Shenton Way. A big supermarket (Shop N Save), Delifrance French cafÃ©, pharmacy, Chinese restaurant, other retail shops literally downstairs. Pubs and other restaurant within a 3-minute walk. 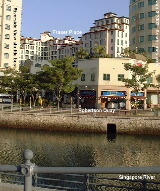 Clarke Quay (favourite food & beverage haunt of every expat) within a 5-minute walk. Free bus shuttle to City Hall subway morning (around 7.30 am - 9.30 am) and evening (around 4.30 pm to 7 pm) at the UE Shopping Mall which is a 2-minute walk away. .
the financial district - Raffles Place or S$5 by taxi. 3-minute taxi ride to Orchard Road or Shenton Way if you don't feel like walking in the humid climate of Singapore. 8-minute walk to the Dhoby Ghaut subway and then to downtown. An opportunity to network with the Tenants (younger Caucasian ladies/gentlemen working in the financial district) at the UE Square and Aspen Heights Condos just across the road and join them for some drinks at the pubs next door. You can stroll along the banks or canal of the clean and green Singapore River with your significant other, go to Boat Quay or Robertson Quay for dinner in addition to Clarke Quay. National Museum & National Library and the Presidential Palace, Plaza Singapura with its American concept supermarket are not too far away. No facilities except a plunge pool and a 80-sq. ft gym with 3 pieces of equipment. 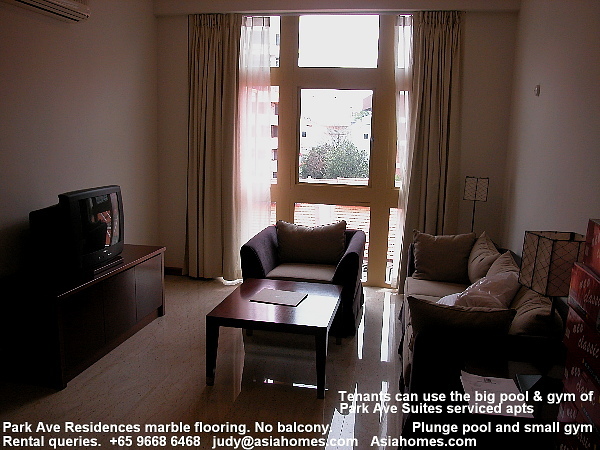 However, you can walk 1 minute to use the bigger pool, business centre and basement gym of Park Avenue Suites. The master bedroom of the townhouses is not big. Proximity card access to your apartment ensuring security. A small swimming pool in the development. Tenant pays for phone line installation and cable broadband ($60 per month). Gas hob. Open concept kitchen. No balcony. Free shuttle bus to City Hall subway from UE Square shopping mall near . 1. The Business Centre, well equipped gym and bigger pool of the Park Avenue Suites serviced apartments which are a 1-minute walk away are available to Tenants of Park Avenue Residences. 1.1 Park Avenue Suites have a hotel-like facade and are carpeted and therefore have a different theme from the Park Avenue Residences with its conservation shophome themes. One-bedroom Rates keep going up and changing. Not possible to list updated rates. E-mail judy@asiahomes.com for latest info. Rates are subject to changes anytime. A two-bedroom now rents around S$8,000 per month. House Agent's Licence No. AD041-07306B. Singapore 319074, Republic of Singapore. 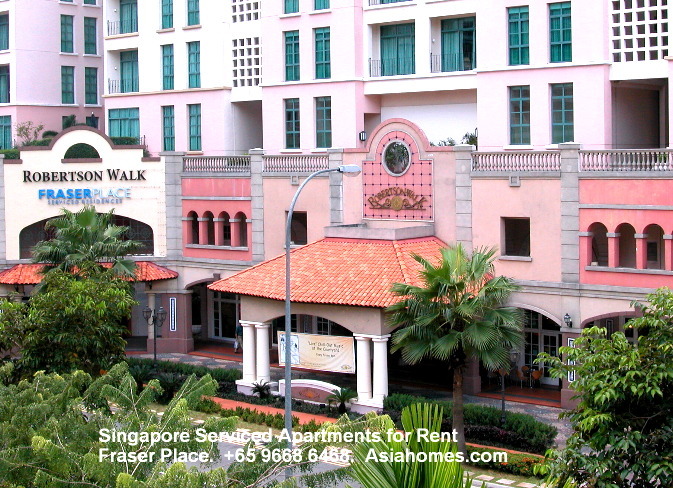 E-mail: judy@asiahomes.com to get a list of housing or to view housing in Singapore. 9668 6469. Fax: +65 6256 0501.